Last week, our three trusted local experts in Greece and three of our core staff concluded an intense week-long recce or reconnoitre in the Dodecanese Islands, in preparation for our Walking and Cruising the Dodecanese trip later this year. Our walking itineraries are, like all our tours, among the best-prepared on the market, so we put major effort into them, to make sure we know all the paths, all the things to show, all the alternatives, and a lot more. The week was a very varied one, of vistas, walks and visits (if you read this in a heavy German accent, it’s alliterative) – a great opportunity to deepen our familiarity with a fascinating and beautiful region. I’d love to give you a detailed diary of the recce – but, in the world of the immortal Sherlock Holmes, it is a story for which the world is not yet prepared. Likewise, I’d love to give you a gallery of what we saw, but we are currently doing maintenance work on this blog, so I cannot use that function. None of this will deter us from sharing some of the experience with you, this time in the form of a series of panoramic images. Day 1: Our four experts resident in Greece travelled via Rhodes. A great opportunity to revisit one of our favourite sights in the island’s medieval capital: the 15th century Hospital of the Knights of Saint John, now home to the Archaeological Museum. It is a treasury of fascinating finds, and an impressive architectural monument. Day 1: Perhaps our favourite part of the Rhodes exhibits is the outdoors gallery of pebble mosaics from the 2nd century BC. We have written about them before, more than once. The one shown here, a true masterpiece of its kind, shows Triton, a legendary sea creature. Day 2: We continued to beautiful Kalymnos, where we were joined by our British colleagues. Together, we undertook our first walk, in the verdant valley of Vathy. Although we have often anchored near here on our cruises, this part of the island has not been part of our itineraries so far. It contains an enormous amount of Early Byzantine remains, including about a dozen ruined churches. One of the finest is the enormous Taxiarchis (Archangel Michael). Set upon the remains of an ancient Greek fortification, the 7th/8th and 10th/11th century basilica is well-preserved, some of its walls still standing to the height of the roof. Day 2: During our intensive exploration of the Vathy valley, we also had a moment or two to admire the tranquil beauty of its well-protected and cliff-girt harbour at Rina. It must have been an important stopping-point for the Byzantine vessels supplying Constantinople with Egyptian grain. Day 3: In the morning, we set out for the rocky islet of Telendos, nestled in the Bay of Emboreio on the western side of Kalymnos. 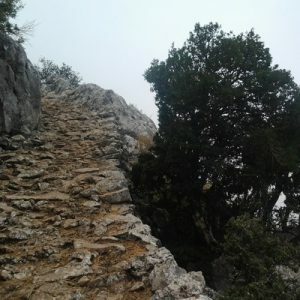 It has only few dozen permanent inhabitants, We found a surprising wealth of Late Roman/Early Byzantine monuments, some of them surprisingly well-preserved, but also some difficult terrain. Day 3: In the afternoon, we scaled the Kastro, the main medieval castle at the centre of Kalymnos. In times of trouble, this was the main centre of settlement in the island, safely removed from the exposed shores. It offers superb views of the labyrinthine and lively town of Pothia. The secondary castle of Chrysocheria (the ‘Golden Hand’) is visible on the right, the island of Kos in the background. Day 4: We spent the day exploring various parts of the island of Leros. 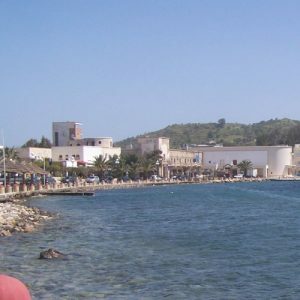 It is famous as a major navy and army base for the Italian occupiers of the Dodecanese between 1912 and 1943, until its loss to the Germans in the Battle of Leros. On Mount Patela, with grandiose views over much of the Eastern Aegean, we encountered a whole series of fascinating remains from that era, including a system of underground tunnels and a large barracks. What about these strange wall paintings? Are they Italian or German work? Day 4: The most remarkable structure on Mount Patela, however, is the acoustic mirror. The concrete structure, with three large concave walls and a sunken chamber at the centre, is an important piece of engineering, built to catch the sound of approaching air planes before the advent of radar. It is one of the best-preserved examples of its kind. Day 5: Due to stormy weather, we were forced to extend our stay on Kalymnos by a day. A great opportunity to relax, discuss plans, and explore the sights of Pothia Town, including the spectacular archaeological museum with its extraordinary collection of Ancient Greek sculpture from the sanctuary of Apollo Dalios. Day 5: At the Naval Museum, a local expert explains the island’s long history of sponge-diving, a tradition going back to antiquity and the source of Pothia’s great wealth in the 19th and early 20th centuries. Here, Peter is seen trying his hand at trimming a sponge. Day 6: …but the main aim of our walk was the castle of Palaio Pili, set on craggy rocks overlooking the island’s fertile coastal plain. The castle was occupied by the Knights of Saint John in the 14th to 16th centuries, but is Byzantine in origin. Some scholars have also suggested the presence of a prehistoric predecessor..
Day 6: In the afternoon, we undertook a very scenic walk to and through the unexcavated ancient city of Astypalaia (not to be confused with the island of the same name), with its temples and theatre, on the Kefalos Peninsula in the far west of Kos. At the Panagia Palatiani, a recent chapel sites atop a Byzantine church built on (and also built of) the remains of an ancient Greek temple. Day 6: The ruined basilica of Agios Stefanos is set right by the sea. A visit to this beautiful and peaceful spot was our reward for a long day. Day 6: I am cheating a little here – this image is not from our March 2018 recce. Originally, we were meant to spend this day on Nisyros, but as the weather interfered, I will prepare that part of our walking cruise in a few weeks. The island’s famous highlight is the volcanic caldera with the steam crater of Stefanos at its centre. Day 7: On our last morning in the islands, we visited the excellent archaeological museum in Kos Town, reopened in 2016 after extensive redesign. We visit it on many of our cruises, but it is always good to have time for a thorough look at its numerous exhibits. This time, I was taken by this lovely golden funeral wreath from the 2nd or 1st century BC. Day 7: On the flight back to Athens, the clouds briefly open to offer a brief glance at Kalymnos and Telendos. We’ll be back soon! So, here we are. 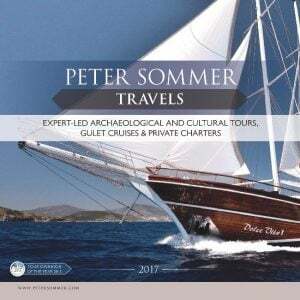 The reconnoitre has been extremely useful, both for the job at hand and to increase our knowledge of a region we travel frequently – the Dodecanese are the venue of one of our most popular week-long cruises, From Kos to Patmos, and of our spectacular two-week Cruising the Dodecanese. I will report from my additional recce of Nisyros in due course. 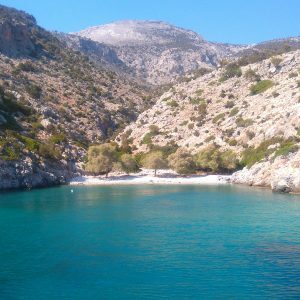 If you enjoyed this post, you should consider joining us on our Walking and Cruising the Dodecanese this autumn!